Syst. Nat., ed. 10. , 2: 863 (1759). Cobra lily, Kasmanti. Wied il-Kbir, Malta 10/1/17. Origin and Habitat: Winter-rainfall areas of Southwestern and Eastern Cape (from Darling just north of Cape Town, along the coast as far east as Kentani) South africa. It is often planted elsewhere for ornament in Mediterranean climate areas, where it naturalizes easily. Altitude range: Chasmanthe aethiopica occurs at fairly low altitudes. Habitat and ecology. This species grows mainly coastal in bush and on forest margins, often on sandy flats and dunes, where it spreads by runners and often forms large colonies. Its coastal habit means that it rarely experiences extreme climatic conditions in nature and will not withstand temperatures much below freezing. In their native range, the flowers are pollinated by sunbirds. The brightly-coloured flowers attract these birds that visit them to drink nectar. The seeds have a thin, fleshy seed coat that is watery and sweet, and are adapted to dispersal by fruit-eating birds. The birds are attracted to the brightly coloured seeds and fruits and successfully transport the seeds from bush clump to bush clump. Description: The cobra lily, Chasmanthe aethiopica, is a cormous herbaceous deciduous, perennial rowing up to 40-65 cm high, with sword-shaped and soft-textured flat leaves that bears a prominent vein. 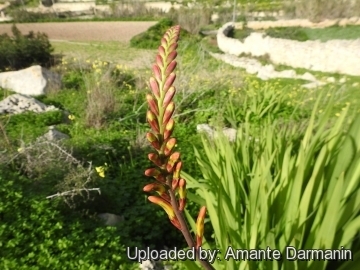 It produces several orange irregular-shaped flowers in a 1- or 2-ranked unbranched spike. The flowers are characterized by having a long tube, flaring abruptly above a narrow twisted base, and a large hooded upper perianth segment. Derivation of specific name: The specific epithet aethiopica may today mislead one into assuming that this plant is a native of northeast tropical Africa, but it dates from a time when 'Aethiopia' usually referred to the whole of Africa south of Egypt. Corm: Globose, large; tunics brown, membranous. Stem branched, 90-120 cm long. Leaves. Basal leaves several, pale green, sword-shaped with a raised midrib, forming a fan-shaped rosette, soft-textured, 30-45 cm long, 2.5 or more broad, moderately firm in texture, green. Leaves of the stem are smaller. Flowers: Many red-yellow, zygomorphic, arranged in a moderately dense spike 15-28 cm long on an erect or, more often, almost horizontally inclined stalk with the flowers set alternately outwards on both sides of it. The spathe-valves are oblong-lanceolate, greenish, 12-18 mm long. The flowers are trumpet-shaped 36-42 mm long, with a perianth-tube that is divided into a slender, twisted lower portion, 7-15 mm long, and then abruptly inflated in the upper two-thirds into a cylindrical upper portion, 16-25 mm long. Perianth-segments (tepals) 6 unequal, orange-red, at first with a greenish/yellowish tube, upper segment red, spoon-shaped, held horizontally over the stamens, 25-35 mm long, the others much shorter, spreading 10-15 mm long. Stamens held together and gently arched, 40-50 mm long reaching to the top of the upper segment. Fruits (capsules): Oblong, reddish purple within, 12 mm long, splitting open at maturity to release the seeds. Seeds:*** Turgid, pea-sized, thinly fleshy, orange-coated, not winged. 3) Goldblatt, P., Manning, J. & Dunlop, G. “Crocosmia and Chasmanthe”. Royal Horticultural Society Plant Collector Guide. Timber Press, Portland. 2004. Cultivation and Propagation: Chasmanthe aethiopica is one of South Africa's that are grown in most countries in the world. It is so drought resistant and robust that it is planted for ornament in Mediterranean climate areas, where it naturalizes easily. 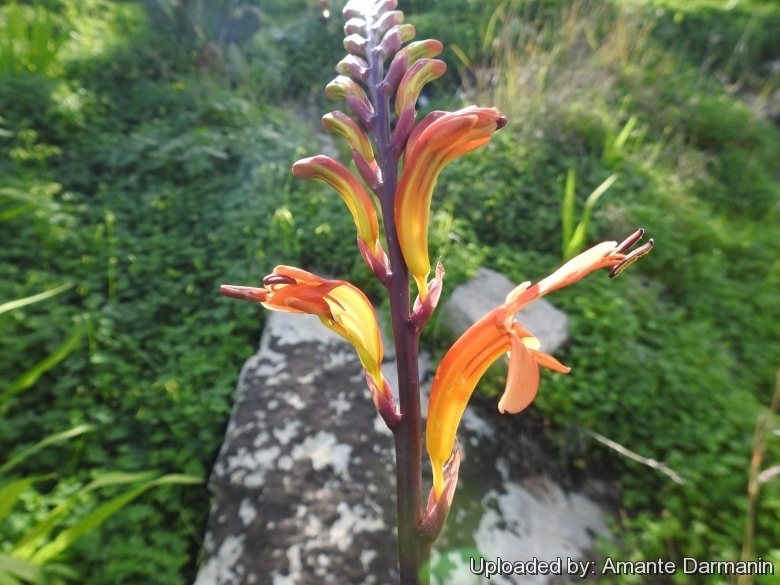 This attractive species is one of the earliest of the Cape bulbs to flower, its spikes of orange, tubular flowers providing welcome interest to the winter garden. Flowers are useful in cut flower arrangements, and they make excellent pot plants. In areas that have cold winters they are generally grown in large pots or tubs that can be protected from frost. Soil: Chasmanthe aethiopica thrives in relatively fertile, freely draining soil and will soon spread naturally through division of the corms in favourable situations. Fertilization: They will flower regularly if fed with a slow release fertiliser in the growing period. Water requirements: Pants are winter-growing and must be kept dry during their summer dormancy. In well-drained soil they will survive some moisture during this period but should not be allowed to remain too wet. Hardiness: Zones: 8-11. Although a light frost is tolerated, protection may be needed if the temperature drops below -5° C.
Light requirements: Sun to partial shade. It flowers best in sunny or partially sunny situations and is a lovely species for underplanting beneath deciduous trees, where it can be left to run free. Maintenance: Lift and divide clumps every four or five years to ensure flowering. Remove old flowering stalks for a neat appearance. Plants should be left undisturbed for optimum flowering. Pests and disease: Its early growth and flowering mean that it is seldom prey to the insect pests that attack later-growing bulbs. 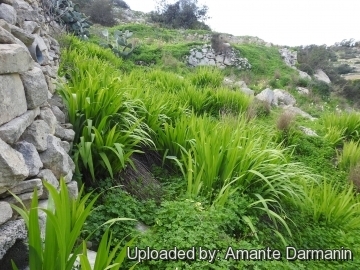 Uses: It is an excellent groundcover plant for stabilizing soil on slopes and preventing erosion. Propagation: Division of established clumps is the best way to be sure that plants will be true to type. The ease with which the species multiplies means that is must be repotted frequently if not grown in the garden.